Yesterday, as promised, the weather cooled and clouds rolled in during the afternoon. But, having already extracted as much sun as we could stand (which precipitated an emergency trip to the pharmacy for lip balm, sun block and After-Burn) we retreated to the car and drove to Cromer. The coastal route from Wells to Cromer visits some picturesque little villages. Unfortunately, they are so little that driving through them can be tricky, especially when meeting a bus. It did occur to me that it might be nice to explore one or two of these twee little burgs but the road did not encourage stopping and there were no car parks. Also, there wasn’t a lot to see. If we did find a place to stash the car, all we could have done was walk along the very tight roadway while trucks and buses squeezed past us. It was actually better seeing the villages from the car, as we were going about walking speed anyway. 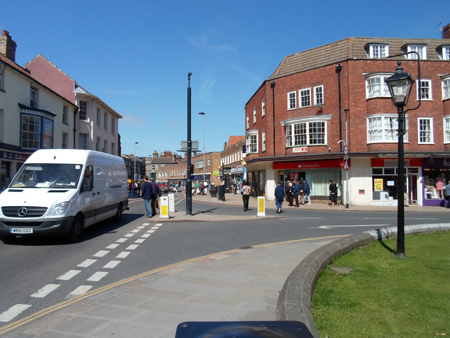 Eventually we came to Cromer, pulled into the municipal car park on the edge of town and had the same debate we always have when we arrive in a new town for sight-seeing purposes: how much time should we put on the meter? One hour would be ludicrous. Two would hardly be enough and three, though probably plenty, might be cutting it close. So we spent £4.80 for four hours worth of parking and returned to the car twenty minutes later. Sorry, but Cromer just didn't do it for me. We went to Cromer with no expectations, which was good because they would have been dashed. The first thing I noticed about the town was that the Christmas decorations on the street lights had not yet been taken down and this did not bode well. The town itself looked tired and the pier—one of its main drawing points—was something less than awe-inspiring. 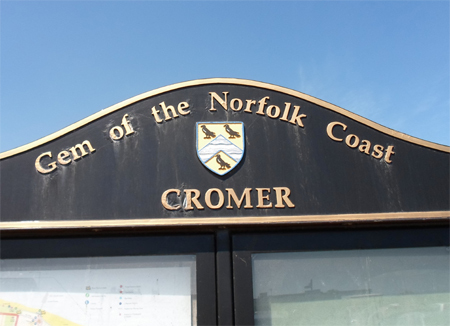 Cromer is billed as “The Gem of the Norfolk Coast,” which is a bit like calling Bayonne, New Jersey the Gem of Eastern Seaboard. The rest of the day was taken up with a more detailed exploration of Wells, and its quirky, locally owned, shops. It really was refreshing to not have a Boots, Costa Coffee, Next and Marks & Spencer along the main shopping street. For one thing, you wouldn’t have been able to fit them, as the shopping district is about 800 feet long and ten feet wide. But you don’t go to Wells for the shopping, you go for the beach, or to explore the surrounding countryside, which is a good thing, because after an hour of wandering around the shops, we felt as if we had seen all we needed to see so we went back to our holiday rental to eat dinner and catch the latest installment of Springwatch. Today we were up and out sharpish, for a pilgrimage to Constable Country. This trip took us from the northern coast of East Anglia, to the southern edge of Suffolk. It was a two-hour drive, but well worth it. A bit south of Ipswitch, just beyond the little village of East Bergholt—and with the help of very little signage, I might add—is a road so tiny your wife has to insist several times that you need to drive down it to get to where you want to go. 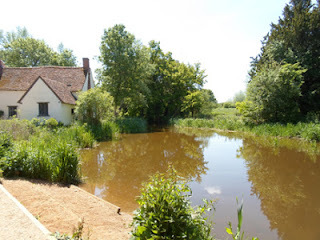 So, with great trepidation and cow parsley brushing both sides of our little car, we eventually made it to Flatford. 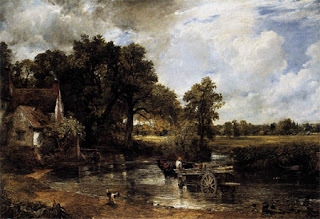 Bergholt and Flatford—with its mill, surrounding buildings and canal locks—were home to John Constable (for those of you scratching your heads, Constable was a famous painter) and a surprising number of his paintings depict scenes in and around that small area. It’s easy to see why; it’s a stunningly beautiful place and, since having been restored by the National Trust—including a B&B, RSPB sanctuary, Field Studies Council Centre, art and environmental courses, guided tours, gift shop, restaurant and boat hire—it is also a stunningly lucrative place. 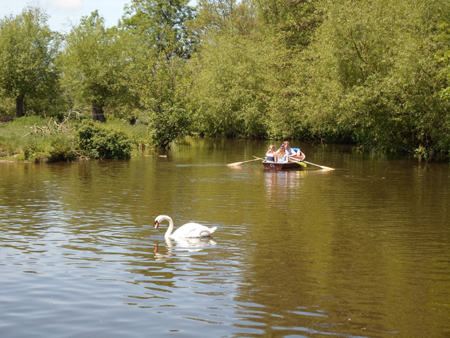 You can rent a boat and row down the idyllic River Stour. We opted to remain on dry land. Don’t let that previous paragraph mislead you; the National Trust is doing a marvellous job of keeping the location tranquil and as true as possible to its origins. All those add-ons do not detract from the atmosphere, but operate in the background to enhance the experience. It’s not like in America, where a flashing neon sign would invite you to ride—if you dare—the terrifying Hay-Wain Flume or the Canal Cyclone, after which you could buy a corn-dog and some cotton candy at the Bridge Cottage Arcade. 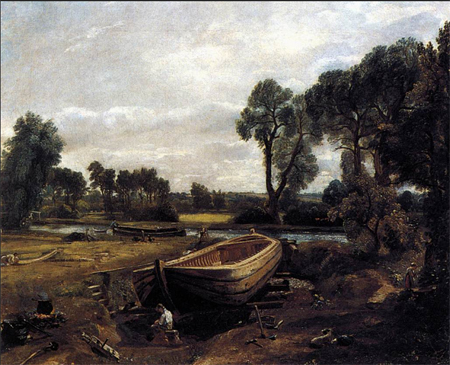 What it looked like in Constable's day. What it looks like now. Notice the addition of a tea room. 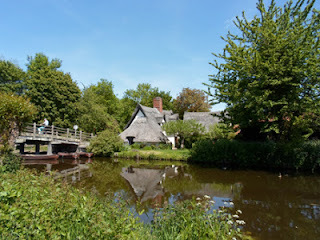 We spent several hours there, walking the trails, admiring the viewpoints of the paintings (helpfully marked in the guidebook) and enjoying tea next to the canal. It was a truly marvellous day. block of flats or an industrial estate. 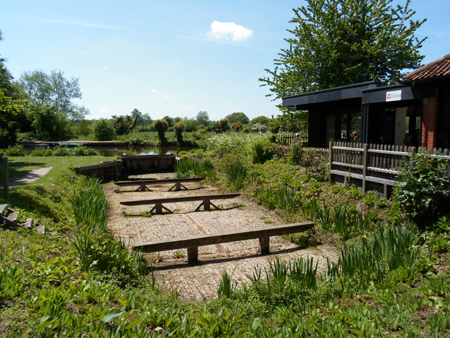 Tomorrow we’re going to explore King’s Lynn and on Friday we’re going to Norwich, but unless they have a spectacular Flume ride or a really flashy arcade, they’re going to have a hard time living up to Constable Country. Norwich - if your interested in architecture then the cathedral is worth a look (and can you spot the musket ball from the civil war that's still imbedded in a tomb?). If you prefer history then try the castle. I think they have a Boots, Costa Coffee, Next and Marks & Spencer so you'll probably be dismayed at it's similarity to other places though. Having just returned from my first trip across the pond, I'm quite excited to now understand your references to Boots and Springwatch. I was amazed at how little room they leave along the sides of the road for walkers, considering how much walking the English do. It seems they do it through fields, because I was walking on a foot-wide path and cars were zooming past me. Not the most comforting walking experience. OK, I think Boots is a drug store chain and Marks & Spencer are department stores, but what is Next? Are the water levels a lot higher than they were in Constable's day? The perspective seems so different than your photos, almost like he was up on a perch. Or maybe it's just in the eye of the beholder! Next is a clothing store. And I expect Constable was sitting down; I was standing on a wall for the Hay Wain shot and up on the bank for the Boat Building shot. It's a little more overgrown these days, too. Darn! Missed opportunity ;) Also, there were other towns and villages and shops and restaurants up there with a "-next-the-Sea" suffix. Good thing I left my markers home; I would have been very busy.